FEBE is a simple but very useful have Firefox extension for managing Firefox Extensions and even your browser themse, cookies and bookmarks. I hope Mozilla makes this a native feature of Firefox 2.0. Say you have installed tons of Firefox extensions on your home computer and want to mirror the same browser setup on your work computer. Firefox itself provides no easy way to export and migrate settings across computers. The old style of doing things was to write the extension names on a piece of paper, carry that to work, and install each of the extension after searching it on the Mozilla addons website. That was very cumbersome and often you would loose some extensions that never made to the official Mozilla site. Well, the new approach is to install FEBE (Firefox Extension Backup Extension). It backs up your extensions, themes, and (optionally) your bookmarks, preferences and cookies. 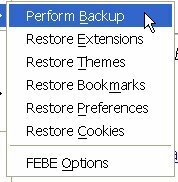 Febe V3 will backup your entire Firefox Profile in one click. Why would anyone need Google Browser Syn now which doesn't do extensions. Tech Tip: Firefox extension are zipped files with an .xpi extension. If you like to see how that extension was created, unzip the xpi file contents with 7-zip and you will find a bunch of .jar files. Extract them using 7-zip again and open the extract .xul, .css, .js files in Notepad. Extension Hacked ! !